Oarsome Crutch Grips are crutch grips that slide over standard crutch handles then mould to the shape of your hand. Oarsome crutch grips provide a shock absorbing cushion. They relive the downward pressure felt on the palms of the hands, wrists and shoulders.Use crutches and you will understand how uncomfortable they can be on your hands. Slide these hand grips over your standard crutch handles and the pain and discomfort is eased. The hollow bit faces upwards. The grips provide a cushioning effect for your hands, thus hugely reducing / spreading out the pressure on your palms. The hollow section squashes down when pressure is put on it but springs up again instantly. The handgrips were originally invented for rowing machine handles, however with a little ingenuity they have turned out to be fantastic crutch grips. There is a cushion that relieves the downward pressure placed on the crutch handle. It absorbs the impact previously passed to your hand or upper body. The hand pain and pressure on your wrists will ease. The stress on your entire upper body will be significantly reduced. Crutch users of all ages can use the Oarsome and they have been recommended by physiotherapists. The secret is that the Oarsome crutch grips maintain their shape when not in use. They made from a special latex-free soft plastic, which is widely used in the medical industry. The material is also used for products such as baby spoons. An antibacterial agent is included in the manufacturing process meaning that the grips are antibacterial throughout, not just an outside cover. The sporty and inclusive product image is popular amongst people with disabilities. 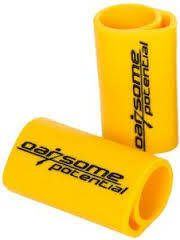 The Oarsome Grips worked brilliantly for rowing across the Atlantic ocean. Consider the extreme conditions and strain on ocean rowing oars for 24 hours a day and for 74 days of rowing. Many customers are long term and permanent crutch users, there are very few repeat orders. The answer is, they last for a long time. 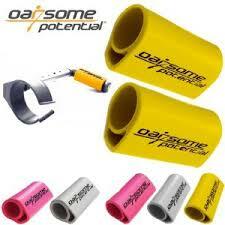 Buy Oarsome Crutch Grips now. If you use crutches you will not regret the purchase.